French communications satellite. 3-axis stabilized using bipropellant thrusters (750 kg propellant - unified with apogee insertion and maneuvering propulsion) and momentum wheels. Status: Operational 1975. First Launch: 1975-08-27. Last Launch: 1994-01-24. Number: 12 . Payload: 130 kg (280 lb). Thrust: 392 N (88 lbf). Gross mass: 866 kg (1,909 lb). Height: 2.25 m (7.37 ft). Span: 20.70 m (67.90 ft). Solar arrays generated 2.0 kW at end of life. Family: Communications, Geosynchronous orbit. Country: France. Launch Vehicles: Atlas, Thor, Delta, Space Shuttle, Delta 2914, Ariane, Ariane 2/3, Delta 2 7000, Ariane 3, Ariane 44LP, Ariane 44L, Delta 7925, Atlas II, Delta 2000. Propellants: N2O4/MMH. Projects: DFS, Eutelsat. Launch Sites: Cape Canaveral, Cape Canaveral LC17B, Cape Canaveral LC17A, Cape Canaveral LC36B, Cape Canaveral LC39A, Kourou, Kourou ELA1, Kourou ELA2. Agency: Arabsat. Bibliography: 2, 278, 5, 6, 6917, 13139, 13140, 13141. 1975 August 27 - . 01:41 GMT - . Launch Site: Cape Canaveral. Launch Complex: Cape Canaveral LC17A. LV Family: Thor. Launch Vehicle: Delta 2914. Symphonie 2 - . Payload: Symphonie MV2. Mass: 398 kg (877 lb). Nation: France. Agency: CNES, DFVLR. Class: Communications. Type: Civilian communications satellite. Spacecraft: Spacebus 100. Completed Operations Date: 1985-01-01 . USAF Sat Cat: 8132 . COSPAR: 1975-077A. Apogee: 35,873 km (22,290 mi). Perigee: 35,866 km (22,286 mi). Inclination: 12.70 deg. Period: 1,440.40 min. Jointly registered by the Federal Republic of Germany (A/AC.105/INF.329) and France (A/AC.105/INF.330). Symphonie flying model no II. Experimental telecommunications satellite. Orbit: geostationary. Also registered by the United Stat es in A/AC.105/INF.331 as 1975-77A, category C, with orbit 1427.4 min, 35364 x 35870 km x 0.0 deg Positioned in geosynchronous orbit over the Atlantic Ocean at 11 deg W in 1975-1985 As of 1 September 2001 located at 164.06 deg W drifting at 1.071 deg W per day. As of 2007 Mar 8 located at 167.97E drifting at 1.046W degrees per day. 1985 February 8 - . 23:22 GMT - . Launch Site: Kourou. Launch Complex: Kourou ELA1. LV Family: Ariane. Launch Vehicle: Ariane 3. 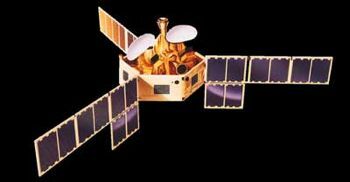 Arabsat 1A - . Mass: 532 kg (1,172 lb). Nation: Arab States. Agency: Arabsat. Program: Arabsat. Class: Communications. Type: Civilian communications satellite. Spacecraft: Spacebus 100. Completed Operations Date: 1992-07-31 . USAF Sat Cat: 15560 . COSPAR: 1985-015A. Apogee: 35,753 km (22,215 mi). Perigee: 35,724 km (22,197 mi). Inclination: 8.20 deg. Period: 1,433.70 min. Stationed at 19 deg E. Positioned in geosynchronous orbit at 19 deg E in 1985-1991 As of 27 August 2001 located at 76.76 deg E drifting at 0.635 deg E per day. As of 2007 Feb 28 located at 87.85E drifting at 0.629E degrees per day..
Arabsat 1B - . Payload: Discovery F5 / Morelos 1 [PAM-D] / Telstar 303 [PA. Mass: 592 kg (1,305 lb). Nation: Arab States. Agency: Arabsat. Program: Arabsat. Class: Communications. Type: Civilian communications satellite. Spacecraft: Spacebus 100. Completed Operations Date: 1992-06-01 . USAF Sat Cat: 15825 . COSPAR: 1985-048C. Apogee: 35,746 km (22,211 mi). Perigee: 35,737 km (22,205 mi). Inclination: 1.90 deg. Period: 1,433.80 min. Released by STS 51G 18 June 1985; 26 deg E. Positioned in geosynchronous orbit at 26 deg E in 1985-1992 As of 5 September 2001 located at 135.45 deg W drifting at 0.555 deg E per day. As of 2007 Mar 9 located at 165.57E drifting at 0.400E degrees per day..
1989 June 5 - . 22:37 GMT - . Launch Site: Kourou. Launch Complex: Kourou ELA2. LV Family: Ariane. Launch Vehicle: Ariane 44L. DFS 1 - . Payload: Kopernikus 1. Mass: 1,416 kg (3,121 lb). Nation: Germany. Agency: Bundespost. Program: DFS. Class: Communications. Type: Civilian communications satellite. Spacecraft: Spacebus 100. Completed Operations Date: 1996-01-01 . USAF Sat Cat: 20041 . COSPAR: 1989-041B. Apogee: 35,889 km (22,300 mi). Perigee: 35,683 km (22,172 mi). Inclination: 0.00 deg. Period: 1,436.10 min. Multipurpose communications; 23.5 deg E. Communications satellite, position 23.5E, Ariane 4 flight no 20. Positioned in geosynchronous orbit at 23 deg E in 1989-1993; 33 deg E in 1993-1995 As of 5 September 2001 located at 90.12 deg E drifting at 1.435 deg E per day. As of 2007 Mar 10 located at 41.93E drifting at 1.416E degrees per day. DFS 2 - . Payload: Kopernikus 2. Mass: 1,418 kg (3,126 lb). Nation: Germany. Agency: Bundespost. Program: DFS. Class: Communications. Type: Civilian communications satellite. Spacecraft: Spacebus 100. USAF Sat Cat: 20706 . COSPAR: 1990-063B. Apogee: 36,014 km (22,378 mi). Perigee: 35,965 km (22,347 mi). Inclination: 1.40 deg. Period: 1,446.50 min. West German DBS; 28.5 deg E. Communications satellite, position 28.5E Ariane 4 flight no 37. Positioned in geosynchronous orbit at 28 deg E in 1990-1999 As of 30 August 2001 located at 32.30 deg E drifting at 0.451 deg W per day. As of 2007 Mar 11 located at 128.29W drifting at 2.623W degrees per day. 1990 August 30 - . 22:46 GMT - . Launch Site: Kourou. Launch Complex: Kourou ELA2. LV Family: Ariane. Launch Vehicle: Ariane 44LP. Eutelsat II F1 - . Mass: 1,878 kg (4,140 lb). Nation: Europe. Agency: Eutelsat. Program: Eutelsat. Class: Communications. Type: Civilian communications satellite. Spacecraft: Spacebus 100. USAF Sat Cat: 20777 . COSPAR: 1990-079B. Apogee: 35,806 km (22,248 mi). Perigee: 35,769 km (22,225 mi). Inclination: 0.10 deg. Period: 1,436.20 min. Stationed at 13 deg E. Telecommunications satellite. Registered by France in ST/SG/SER.E/234 and 239 until EUTELSAT can register the satellite. EUTELSAT is the European Telecommunications Satellite Organization. Positioned in geosynchronous orbit at 13 deg E in 1990-1998; 48 deg E in 1999. As of 26 August 2001 located at 48.45 deg E drifting at 0.011 deg E per day. As of 2007 Mar 9 located at 6.45E drifting at 3.328W degrees per day. 1991 January 15 - . 23:10 GMT - . Launch Site: Kourou. Launch Complex: Kourou ELA2. LV Family: Ariane. Launch Vehicle: Ariane 44L. 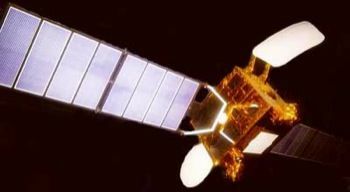 Eutelsat II F2 - . Mass: 1,878 kg (4,140 lb). Nation: Europe. Agency: Eutelsat. Program: Eutelsat. Class: Communications. Type: Civilian communications satellite. Spacecraft: Spacebus 100. USAF Sat Cat: 21056 . COSPAR: 1991-003B. Apogee: 35,814 km (22,253 mi). Perigee: 35,759 km (22,219 mi). Inclination: 2.20 deg. Period: 1,436.10 min. Stationed at 10 deg E. Telecommunications satellite. Registered by France in ST/SG/SER.E/234 and 239 until EUTELSAT can register the satellite. EUTELSAT is the European Telecommunications Satellite Organization. Positioned in geosynchronous orbit at 10 deg E in 1991-1999 12 deg W in 1999-2000 As of 4 September 2001 located at 12.60 deg W drifting at 0.009 deg W per day. As of 2007 Mar 10 located at 28.49E drifting at 4.801W degrees per day. 1991 December 7 - . 22:47 GMT - . Launch Site: Cape Canaveral. Launch Complex: Cape Canaveral LC36B. LV Family: Atlas. Launch Vehicle: Atlas II. 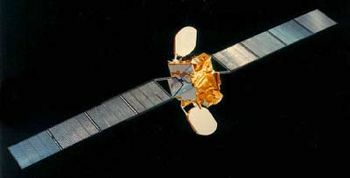 Eutelsat II F3 - . Mass: 1,874 kg (4,131 lb). Nation: Europe. Agency: Eutelsat. Program: Eutelsat. Class: Communications. Type: Civilian communications satellite. Spacecraft: Spacebus 100. USAF Sat Cat: 21803 . COSPAR: 1991-083A. Apogee: 35,802 km (22,246 mi). Perigee: 35,769 km (22,225 mi). Inclination: 2.00 deg. Period: 1,436.10 min. Stationed at 16 deg E. Telecommunications satellite. French registration 1991-8. Transfer orbit was 663 min, 200 x 36000 km x 7.0 deg. Registered by France in ST/SG/SER.E/249 until EUTELSAT can register the satellite. EUTELSAT is the European Telecommunications Satellite Organi zation. Launch vehicle put payload into supersynchronous earth orbit with IFR trajectory option. Positioned in geosynchronous orbit at 16 deg E in 1992-1998; 36 deg E in 1999. As of 1 September 2001 located at 21.51 deg E drifting at 0.017 deg E per day. As of 2007 Mar 11 located at 74.40E drifting at 3.531W degrees per day. 1992 February 26 - . 23:58 GMT - . Launch Site: Kourou. Launch Complex: Kourou ELA2. LV Family: Ariane. Launch Vehicle: Ariane 44L. Arabsat 1C - . Mass: 1,310 kg (2,880 lb). Nation: Arab States. Agency: Arabsat. Program: Arabsat. Class: Communications. Type: Civilian communications satellite. Spacecraft: Spacebus 100. USAF Sat Cat: 21894 . COSPAR: 1992-010B. Apogee: 35,808 km (22,250 mi). Perigee: 35,763 km (22,222 mi). Inclination: 0.10 deg. Period: 1,436.10 min. Stationed at 31 deg E. Positioned in geosynchronous orbit at 31 deg E in 1992-1997; 55 deg E in 1998-1999 As of 5 September 2001 located at 55.07 deg E drifting at 0.005 deg E per day. As of 2007 Mar 9 located at 172.70E drifting at 5.710W degrees per day. 1992 July 9 - . 22:42 GMT - . Launch Site: Kourou. Launch Complex: Kourou ELA2. LV Family: Ariane. Launch Vehicle: Ariane 44L. Eutelsat II F4 - . Mass: 1,877 kg (4,138 lb). Nation: Europe. Agency: Eutelsat. Program: Eutelsat. Class: Communications. Type: Civilian communications satellite. Spacecraft: Spacebus 100. USAF Sat Cat: 22028 . COSPAR: 1992-041B. Apogee: 35,841 km (22,270 mi). Perigee: 35,806 km (22,248 mi). Inclination: 1.20 deg. Period: 1,438.00 min. Stationed at 7 deg E. Positioned in geosynchronous orbit at 7 deg E in 1992-1999; 10 deg E in 1999. As of 3 September 2001 located at 25.62 deg E drifting at 0.019 deg E per day. As of 2007 Mar 10 located at 120.18E drifting at 4.301W degrees per day..
1992 October 12 - . 09:47 GMT - . Launch Site: Cape Canaveral. Launch Complex: Cape Canaveral LC17B. LV Family: Thor. Launch Vehicle: Delta 7925. DFS 3 - . Payload: Kopernikus 3. Mass: 1,400 kg (3,000 lb). Nation: Germany. Agency: Bundespost. Program: DFS. Class: Communications. Type: Civilian communications satellite. Spacecraft: Spacebus 100. USAF Sat Cat: 22175 . COSPAR: 1992-066A. Apogee: 35,799 km (22,244 mi). Perigee: 35,773 km (22,228 mi). Inclination: 0.50 deg. Period: 1,436.10 min. Stationed at 33.5 deg E. Communication satellite. Longitude 33.5 deg E. Delta II flight no 212. Positioned in geosynchronous orbit at 31 deg E in 1992; 23 deg E in 1993-1999 As of 1 September 2001 located at 23.45 deg E drifting at 0.001 deg E per day. As of 2007 Mar 9 located at 29.79E drifting at 1.955W degrees per day. 1994 January 24 - . 21:37 GMT - . Launch Site: Kourou. Launch Complex: Kourou ELA2. LV Family: Ariane. Launch Vehicle: Ariane 44LP. FAILURE: Stage 3 turbopump overheated.. Failed Stage: U.
Eutelsat II F5 - . Mass: 1,880 kg (4,140 lb). Nation: Europe. Agency: Eutelsat. Program: Eutelsat. Class: Communications. Type: Civilian communications satellite. Spacecraft: Spacebus 100. Decay Date: 1994-01-24 . Launched with Turksat 1..